In Sept. 2014, Hayes allegedly bound his 27-year-old girlfriend with tape and then assaulted her with a knife, scissors and a pool cue. He also allegedly burned her with kitchen utensils. Prosecutors charged Hayes with torture, attempted murder, false imprisonment and other felony offenses. Hayes faced a possible life sentence if the case went to trial. During a preliminary hearing, Hayes’ attorney, Ilan Funke-Bilu, suggested the victim was under the influence of cocaine at the time of the incident. The victim testified that cocaine was a regular part of their relationship, but she also provided a detailed account of the alleged torture. On Jan. 12, Hayes pleaded no contest to felony charges of mayhem, corporal injury and assault with a deadly weapon. Prosecutors dismissed the other charges. Prosecutors say Hayes will have to serve 85 percent of his prison sentence since two of his three convictions are considered violent felonies. Hayes does not yet have any strikes on his record. 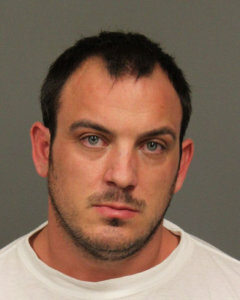 Hayes is currently in the San Luis Obispo County Jail, according to the sheriff’s office website. Hayes was arrested last October for failure to appear on a felony charge. He is being held without bail and is due back in court for sentencing on Feb. 23. What difference does it make if the victim was under the influence of cocaine when she was tortured? None. She was able to recount the events.What did the hospital and doctor report say? Sounds like sentence was to lite. Funke Bilu is considered by some to be the best defense attorney in the County. The DA’s office was probably afraid they would loose. Another corrupt deal. Too bad Mommy’s money can’t get you out of this mess. “prosecutors dismissed the other charges”…an outrage at best. God help us.